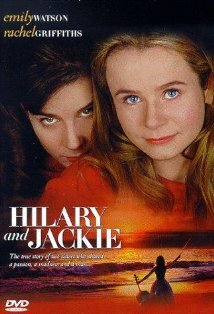 Hilary y Jackie es una película inglesa de 1998 cuyo nombre original es Hilary and Jackie dirigida por Anand Tucker y escrita por Martin Walsh, quien se basó en la estremecedora biografía de la violonchelista Jacqueline du Pré. Protagonizada por Emily Watson y Rachel Griffiths esta historia nos muestra el drama de la vida de las dos hermanas Du Pré, guiadas por sus padres a formar su talento musical, que sin embargo no supieron guiarlas para construir personalidades armoniosas y librarlas de los celos entre hermanas. La educación recibida las instala en un clima de competitividad, que signa su relación hasta adultas. La gran actuación de estas actrices las llevaron a ser reconocidas con la nominación alÓscar por sus respectivas interpretaciones, además la actriz Emily Watson se compenetró tanto con su papel que la llevó a tocar hasta 9 horas diarias para perfeccionarse en el violonchelo. Jacqueline du Pré is arguably the greatest talent to ever play the cello. She combined mind, heart, body and soul to produce the most expressive tones ever to emanate from the instrument. Shy and at the same time bold, she was not only expressive, but played with precision, fullness and purity of tone. At ten years old Jacqueline du Pré studied under William Pleeth. She then studied with Casals, Tortelier and Rostropovich. In 1965 she recorded the Elgar Concerto with Sir John Barbirolli and the London Symphony Orchestra, a recording which established her stardom. Her unselfishness made her a brilliant chamber music player, collaborating with many of today’s greatest names in music. Her friendship with Daniel Barenboim, Itzhak Perlman, Zubin Mehta and Pinchas Zuckerman, led to the famous film by Christopher Nupen of their Schubert “Trout” Quintet. In 1967 she married pianist Daniel Barenboim. TIME magazine wrote, “Thus began one of the most remarkable relationships, personal as well as professional, that music has known since the days of Clara and Robert Schumann.” Their marriage led to some fruitful collaboration, evidenced in many recordings with Barenboim as pianist or conductor. She could not pinpoint the time when she started losing feeling in her fingers, and her arms, as she said, felt like lead. By the fall of 1973 she was diagnosed with multiple sclerosis. She continued to teach on occasion, but the deterioration of her health gained momentum and finally, on October 19, 1987, she died at the age of forty-two. Jacqueline du Pré left us a wonderful legacy of recordings, although certainly not nearly enough for any of us, her admirers. Too often the same recording seems to be recompiled into new collections (ie., there are at least 4 cd /sets which have the Dvorak and Elgar concertos), which only points out our yearning for more. Who wouldn’t like to hear her play the Brahms Double Concerto, the Beethoven Triple, or the Tchaikowsky Rococo Variations? The list can go on and on, but I am grateful for what we do have. Perhaps someday other vaulted tapes will be transferred to CD, other films to DVD, to reveal a little more of this genius that was Jacqueline du Pré.